Shenzhen Grande offers IC programming service which will be performed before the chips are mounted on the board. 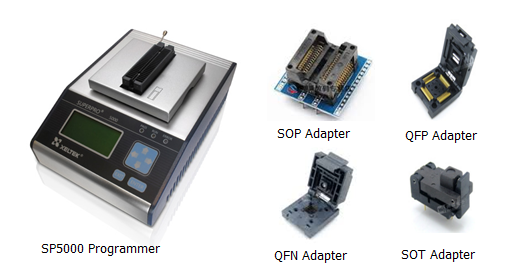 On the technical side , we support various package type, such as: DIP, SDIP, SOP, MSOP, QSOP, SSOP, TSOP, TSSOP, PLCC, QFP, QFN, MLP, MLF, BGA, CSP, SOT and DFN. In addition, some customers maybe concerned about intellectual property issues. We know it is very important for you. So we will sign a Non-Disclosure Agreement (NDA) document upon the customer’s request. We own a powerful programming device called the SuperPro-5000 from Xeltek Inc. It is a professional universal programmer which can support the programming of more than 81,000 devices with 144 built in universal pin-drivers. With independent socket adapters, it can also support: MCU/MPU, EPROM, EEPROM, FLASH, Nand Flash, PLD/CPLD, SD Card, TF Card, CF Card, eMMC Card, eMMC, MoviNand and OneNand. We accept the file formats such as Binary, Intel Hex, Motorola S-Records, Tektronix, Extended Tektronix and POF. We can follow your required settings, configurations and the checksum provided to make sure all programming is done properly. If you still have question about IC programming, please feel free to contact us.